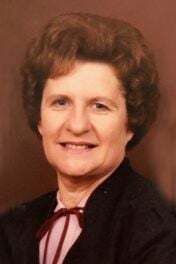 Judith Marie Halvorson, 84, of Menomonie passed away peacefully Thursday, March 14, 2019, at Mayo Clinic Health Systems. She was born Sept. 17, 1934, to John and Dorothy (Ulicny) Kopas in New Haven Township in Northwestern Dunn County. Judy was a lifelong member of Holy Trinity Lutheran Church where she was baptized, married, and watched all her children get confirmed. She was very active in the Ladies Aid late into her life. Judy graduated from Boyceville High School in 1952. She married Richard Halvorson May 30, 1954. Richard and Judy purchased their family's home in 1955 which was north of Connorsville and was affectionally known by them and the neighbors as “the hill.” In 1962, Richard and Judy took the risk of starting their own business, Halvorson Electric. Richard ran the business and Judy did all the bookkeeping and clerical work. In addition to the electrical business, they also had about a dozen cows on Richard's parents farm a mile from their home. Judy would do chores both morning and night with Richard and her kids. In 1995, Judy and Richard moved from “the hill” to Tainter Lake where they enjoyed retirement. They lived there until last spring when they moved to Dancing Oaks in Menomonie. Judy loved her family. It was her passion. Judy made sure that grandparents were a core part of her kids' lives. It was also important to spend lots of time with aunts, uncle, cousins and extended family. Many great memories were made staying with cousins and them staying with us because that's what families did in Judy's opinion. Judy and Richard enjoyed traveling and wintered in Gulf Shores, Ala., but what she enjoyed most was her time on Red Cedar Lake in Birchwood with her kids and grandkids. Those days were filled with pontoon rides, fishing, campfires, time with friends and most important, family. Judy is survived by her husband, Richard; daughter, Linda (Steve) Slind; three sons, Kenneth (Brenda) Halvorson, Gary (Shirley Lundstrom) Halvorson, and Bruce Halvorson; five grandchildren, Amanda (Eric) Rydel, Andrew Slind, Brittany Halvorson, Tyler Slind, and Jessica Lundstrom; and two great-grandchildren, Owen and Gavin Rydel. She was preceded in death by her parents; and her sister, Dorothy Score. Funeral services will be held at 11 a.m. Tuesday, March 19, at Faith Lutheran Church in Menomonie, with Pastor Curtis Brooks officiating. There will be visitation from 4 to 6 p.m. Monday at Olson Funeral Home in Menomonie and at the church one hour prior to the service Tuesday.